NL2210 Tiger Blue is used in similar applications as our traditional NL2200 Green/Black EPDM, but our NL2210 Tiger Blue is made with higher quality compounds for improved flexibility. Tests show that compared to other tier one manufacture's competitive equivalent Tiger Blue is up to 22% more flexible, especially in sub-zero weather! It is also light-in-weight and easy to handle, while its external polyethylene helix reduces dragging friction and permits this hose to be easily maneuvered on the ground. It is also available in Tiger Green (NL2205), Red (NL2212) & Yellow (NL2214). Construction: Tube: Smooth Black EPDM. Cover: Slightly corrugated blue polyethylene helix with black EPDM between. 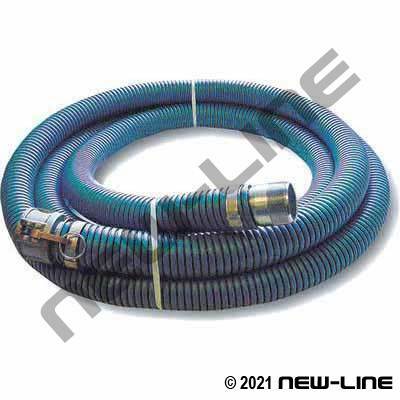 Detail Comments: This hose is not designed for permanent installation in piping systems, especially in short lengths for pump connectors, generators, chillers, HVAC units, or other applications where hard pipe, expansion joints, or stainless steel braided hoses are typically used.